Several of you have asked about what I use for FT-2000 CAT control. I have some experience with three programs: TRX-Manager; Ham Radio Deluxe (HRD); and FT-2000RC. The following images are current screen shots from my installation. I find that each has many features to recommend it. 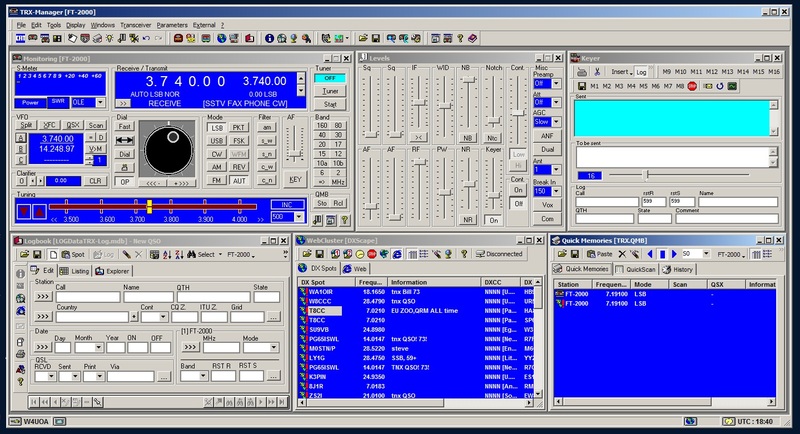 In addition to offering fairly comprehensive radio control from a local Windows PC, each includes a built-in server to provide remote control over the Internet. Each offers many common and unique features--too numerous to list here. Rather, let me tell you what I find most useful about each application. Your operating conditions may recommend other features. Remote operations can be achieved in two primary ways. You can connect to the remote radio control computer using remote connection software such as Windows Remote Desktop; PC Anywhere; LogMeIn; and many others. I personally use Windows Remote Desktop and find it very effective. Once connected to the remote computer, you run the control program as if you were sitting in front of the remote computer. The second approach uses the application servers built in to each of the control programs. The application server built into the application (TRX-Manager, HRD, and FT-2000) "listens" on the designated port for you to connect from your local PC. There are advantages to each approach. I may discuss the relative advantages of each approach at some later time. In either case, I use Skype for the audio link. 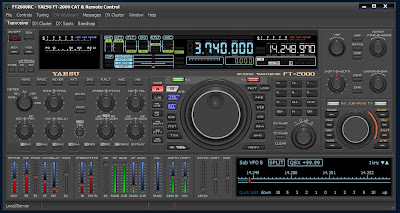 TRX-Manager tightly integrates logbook, DX-Cluster, and rotor control, and in my experience offers the best remote CW keying when run using a local desktop connection such as Windows Remote Desktop. 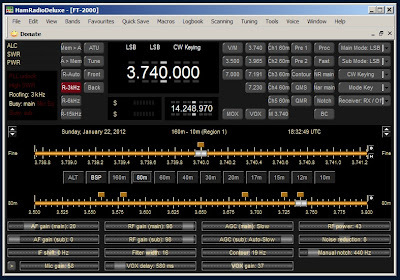 I use TRX-Manager when I would to work CW from my remote station. 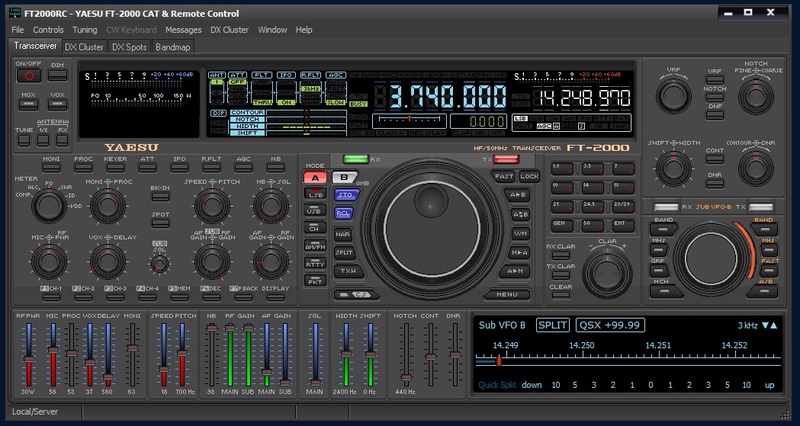 HRD provides a very stable, polished and easily customizable interface. 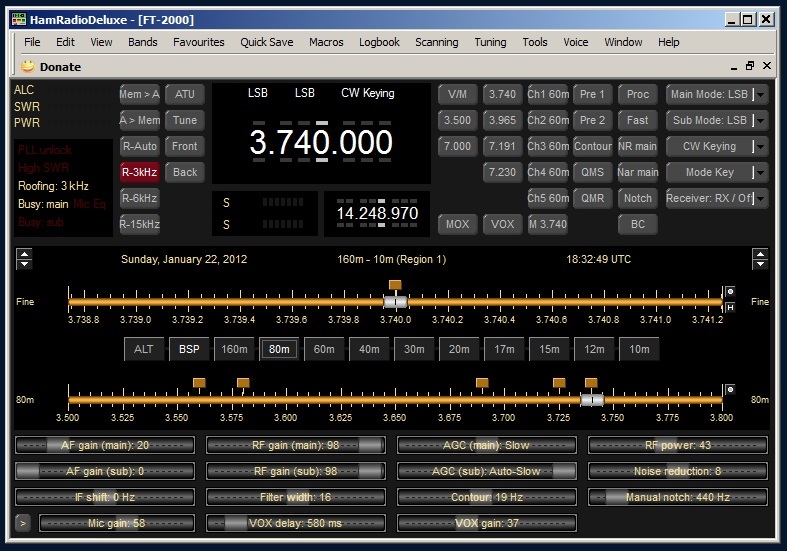 The macro feature allows you to develop your own command sets to control radio features and to attach these commands to a button on the layout. If you look closely at the screen shot above, you can see my customized layout and the ability to put macros "behind" buttons. I find this feature to be extremely useful. It is for this reason, that I use HRD the majority of the time I operate both locally and remote. I encourage you to load my customized layout and macros to see how these features might be of value to you. FT-2000RC is the most elegant of the FT-2000 radio control programs--and, I suspect, in time may become the best FT-2000 control program. I find that FT-2000RC offers the lowest latency of the three when run with its built-in remote server. I believe DF3CB is dedicated to providing access to all of the radio's features through both an exact look and feel visual model and graphical controls as appropriate. Not all of the radio's features are yet available through the interface but I suspect that is just a matter of time. I encourage you to look closely at this application and to support his efforts. If you have an interest in doing your own program development, I would be pleased to send you a Visual Basic 2010 serial port engine that will talk to the FT-2000 on the COM port and at the BAUD rate of your choosing. This particular engine uses interrupt driven communications and can handle the high speed telemetry available on the FT-2000. For an illustration of this high speed telemetry, note the received (RX) and transmission (TX) times in this log file.